What Happened Today in Church History? 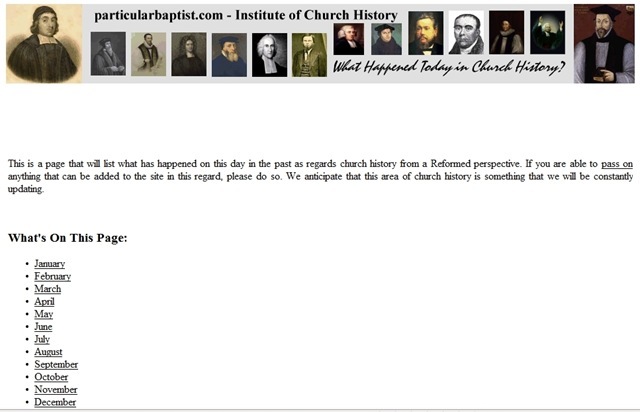 Particularbaptist.com is a ‘portal’ for many Reformed and Particular Baptist resources, including a growing resource pool of church history articles, books and studies. This is an area of the web site at particularbaptist.com that I am seeking to develop further. I am hoping to embed pictures (where possible) of the various historical figures of the past, as well as links to other resources on my site relating to the event covered for each particular day. These links could be to further articles/books dealing with the historical figure, articles/books dealing with the event or that could shed further light on it, etc. In summary, I am seeking to provide as rich an experience as I can for visitors to the site. Obviously this will take some time to complete and in some respects the work will be an ongoing one as more information and resources come to hand. I have decided to start with November and work through each month as we come to them within the coming year.